Did "death ship" captain pervert the course of justice? THE former captain of the now-notorious "death ship" could face charges of perverting the course of justice as the inquest into how three men came to die under his command wraps up. Captain Venancio Salas Jr led the Sage Sagittarius coal ship during its voyage into Australian waters when the vessel's chief cook and chief engineer each died in suspicious circumstances. Two weeks later, Hector Collado, 55, was killed on September 14 at 8am after being struck in the skull then falling 11m as the Sagittarius arrived in Newcastle. Capt Salas came under increasing pressure at the New South Wales coronial inquest, in which he struggled to explain how an on-board voice recorder -- akin to a aircraft's black box -- was somehow disabled on days when crew members died. Capt Salas has previously admitted in court to physically assaulting and tormenting a gay crew member and selling guns on board. In its submissions to Assistant Coroner Sharon Freund this week, counsel assisting Phillip Strickland said the two deaths were caused by "foul play", and the captain had lied to Australian Federal Police about his whereabouts at the time. Capt Salas also had the opportunity and motive to delete data from the bridge voice recorder. The railing of the Sage Sagittarius where Cesar Llanto is thought to have disappeared overboard. International Transport Workers Federation national coordinator Dean Summers said the captain ought to be charged with attempting to pervert the course of justice. He said the ITF -- which represents seafarers worldwide -- would make a case that Capt Salas committed "an indictable offence". Mr Summers said only vessels registered in a developing country, known as a flag of convenience ship, would allow "this kind of brutality". "There's a high cost involved in cheap shipping -- intimidation, bullying -- and in this case, people have paid with their lives," Mr Summers said. Capt Salas was brought before the court after Australian Regional Media revealed he had returned to Australia on a new vessel, without the knowledge of Border Patrol, the Australian Federal Police or the courts. The revelations prompted authorities to compel Capt Salas to give evidence in Sydney, which exposed inconsistencies in the statements he had earlier given to the court and to police. 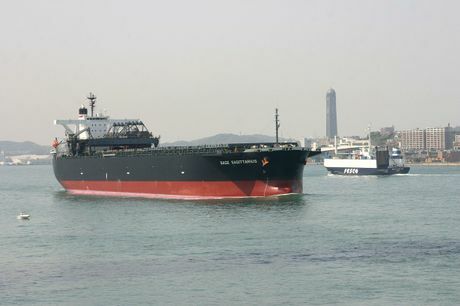 The Sagittarius continues to travel between Japan and Australia, and has previously visited the ports of Abbot Point and Gladstone in Queensland.